When Subjects and Verbs Agree, Sentence Formation Becomes Easy! Constructing a sentence correctly is one of the most important aspects of communicating in any language. This requires an active understanding of the parts of speech, the relationship between those parts of speech, the rules of grammar, and an understanding of popular culture. While the various parts of speech are quite straightforward and simple, understanding the relationship between them can be challenging for a while. Anyone trying to understand these relationships better should always remember the basic rule of English and then progress on to more complex aspects of the language. The most basic rule of the English language that should always be adhered to is called Subject-Verb Agreement. The subject-verb agreement simply means the subject and verb must agree in number. This means both need to be singular or both need to be plural. The subject of a sentence is the person or thing doing the action or being described. The subject of a sentence is a noun or a pronoun. Subjects can be Singular or Plural. Simply defined, the verb is a part of speech which is used to demonstrate an action or a state of being. Without it, there won’t be a sentence, just a bunch of words with an incomplete thought. Verbs too can be of two types, namely Singular and Plural. If you notice, when these Subjects and Verbs are combined, they start making proper sentences and are always paired in a certain way. The boy sits on the couch. The boys sit on the couch. 2. That person is coming today. Those people are coming today. We start seeing a trend and pattern in the English language. This is known as Subject-Verb Agreement. 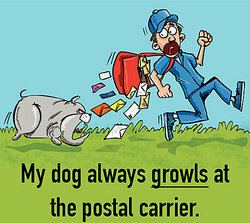 My dog always growls at the postal carrier. Basketballs roll across the floor. These clothes are too small for me. Understanding what a Subject and Verb are separately, does help one to understand how they interact with each other. There are many rules when it comes to Subject-Verb Agreement, but the ones that you can focus on primarily is that Singular Subjects are always accompanied by Singular Verbs and Plural Subjects are always accompanied by Plural Subject. I assume, you want to learn more topics of English Grammar so, click here for another grammar lesson.